Eamonn Brophy came off the bench to net his first goal of the season and earn Hamilton a 2-2 draw against Partick Thistle. 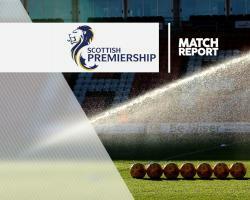 Accies took the lead at Firhill when Massimo Donati headed home in the 14th minute, but the Italian was involved in a defensive mix-up which handed Ryan Edwards an equaliser eight minute later. Both teams went all out for the next goal in an entertaining first half and it was Thistle defender Liam Lindsay who got it, heading home his fourth goal of the season two minutes before the interval. Accies pushed for an equaliser but struggled to create clear chances until Donati played an excellent ball into the left channel for Brophy, who finished just inside the far post. The equaliser provided comfort to Hamilton after they again failed to build on an opening goal - they would be top of the Ladbrokes Premiership if they had held on to each lead this season. Hamilton handed debuts to goalkeeper Gary Woods and former Portsmouth and Hamburg reserves left-back Lennard Sowah. The visitors made a flying start and Rakish Bingham volleyed a good chance wide before Grant Gillespie headed Alex D'Acol's deep cross into the side netting. D'Acol was then denied by a tremendous one-handed stop from Ryan Scully after heading Greg Docherty's lobbed cross towards the top corner, but Accies took the lead from the resulting corner. No Thistle player got close enough to Donati and the Italian headed Ali Crawford's delivery inside the near post. Kris Doolan had an instant chance to level, but Woods saved and Dougie Imrie headed over from Docherty's cross as Accies broke in numbers. Georgios Sarris' diving header came off Donati, giving Edwards the simple task of tapping home. Scully saved from Bingham and Crawford and Callum Booth blocked D'Acol's goal-bound header. Osman turned Gillespie inside and out before flighting a cross which found Lindsay unmarked inside the six-yard box. Doolan had two good opportunities early in the second half, but Woods stopped his first effort before the striker shot a yard wide. Accies pressed, but they were struggling to create clear chances and Woods scrambled to push away a shot from substitute Ade Azeez at the other end. But the visitors got their reward when Brophy netted in the 83rd minute and substitutes Christie Elliot and Gramoz Kurtaj both saw headers well saved at either end.